Jake received a scholarship for his course at City enabling him to join the Formula Student team in the Department of Mechanical Engineering and Aeronautics. 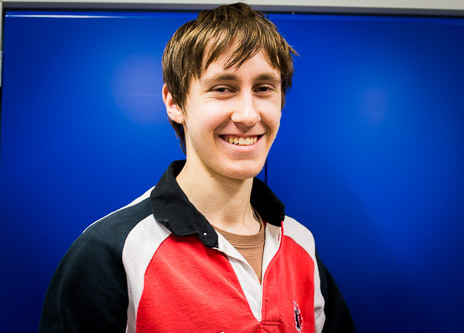 In 2012 Jake competed in the F1 in Schools competition, a worldwide engineering challenge for students. It is a multidisciplinary program where teams of up to six students use CAD/CAM software to design, test, manufacture and race miniature balsa wood Formula One models. The team, called Cold Fusion, won the National Finals early that year and secured a place at the World Finals in Abu Dhabi that November. During the four days of competition the time and hard work that the team put into the competition paid off and the took first place winning the title of World Champion as well as engineering scholarships to City, University of London. With the opportunity to study abroad I couldn't wait to get started at City. Formula Student is the natural progression from F1 in Schools, with a similar project scope as well as related skills. The Formula Student project is an exciting opportunity and I am looking forward to collaborating and learning from the more experienced members of the team. My time in F1 in Schools was some of the most enjoyable in my life and I'm sure I'll enjoy Formula Student just as much. I'm eager to bring new and innovative ideas to the team as well as getting to know the team.